Raja’s mum told Kanak that shalu looked like her. She stated that bahu was also a daughter. Dhaani came and asked about the dishes list in mahabhoj. Raja’s mum said that she had given a big responsibility and she accepted. Kanak told her to ask later. Viplav said, Raj Lakshmi, that they had to separate Mami and Raja. she got tensed. He complimented her beauty and attire. She said now to see her wonder. Dhaani cooked food.kanak asked her to come for some important work. Raja greeted Raj Lakshmi. She said he was looking cute in the dress. He said he would take care of them as Viplav was busy and asked her to apply mehandi. Dhaani refused to let mehandi used on her hands. Kanak told Dhaani to apply mehndi. She said then how would she cook. She replied that it was her tension. Raja told that Shalu’s hands were looking beautiful due to mehndi and asked her to apply mehndi. Shalu got upset. Raj Lakshmi intentionally dropped money. Mami and Raja picked and gave her. She refused to take the fallen money and asked to distribute to needy. Mami took them. Kanak saw Dhani working with one hand and Mehandi on another and asked how would she manage and asked her to hurry. Raj Lakshmi told that she was feeling hot. Raja went to take water. She saw mami staring at her purse.. She went. Mami took the money. She came back and said that how dare she could do that. Dhaani thought that work has done and came out. She told Viplav that Mami has stolen her money. Raja said that he would support truth, not Mami. 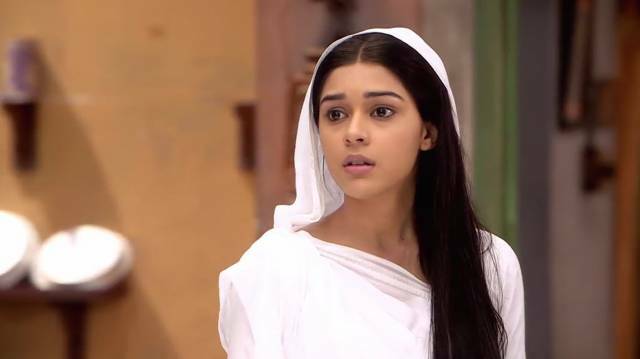 Viplav acted to be shocked. Kanak looked on. Raja stated that he would think about home and said she had stolen from the house before also. She nodded. Raja said shame on her and said she had to leave and took her. Mami said that he hadn’t done right. He told that if police have arrived it would be complicated and Shalu’s house was his. Shalu got happy. Raja’s mum took him and asked if he was mad. He told that he had done to earn respect in someone special’s heart and she wouldn’t understand. Viplav thought where was Dhaani. Dhaani came. He saw her flower jewellery and asked to come. He made her wear it. The title song played in the background. He kissed her forehead and asked her to get ready for plan as nobody could stop their success.